Sometimes we think that the root of all art is the deep-rooted desire in human mind to achieve immortality – be it in name or by deed or by leaving words / music / paintings / sculptures that appeal and resonate with the world over and over. Majority of these attempts may be very popular with one generation but loose their flavour after a few decades. But every now and then an artist produces work that becomes a “Classic” – something that retains its beauty over hundreds of years and seems always to remain contemporary. We have written about Jane Austen in quite early days of this blog. She is someone who is usually remembered for her classic romance “Pride & Prejudice“. In our opinion, it is her wit and wisdom that turns her six published and some unpublished works into memorable pieces of literature. Although “Pride & Prejudice” remains unquestionably most popular, amongst critics “Emma” is sometimes considered her best novel. Emma is a young woman with beauty, wealth and cleverness – surely her life is perfect? But it is only when you place someone in an ideal worldly situation that you can talk about what it means to transition from a child to a responsible adult. That no matter how advantageous our position in the societal scale may be, as a human being, we all have to deal with out share of heartaches & failures. We have to learn to accept our mistakes and learn from them. Emma is one of the all time best “coming of age” novels. It has inspired multiple adaptations, including a Sonam Kapoor movie called “Aisha“. 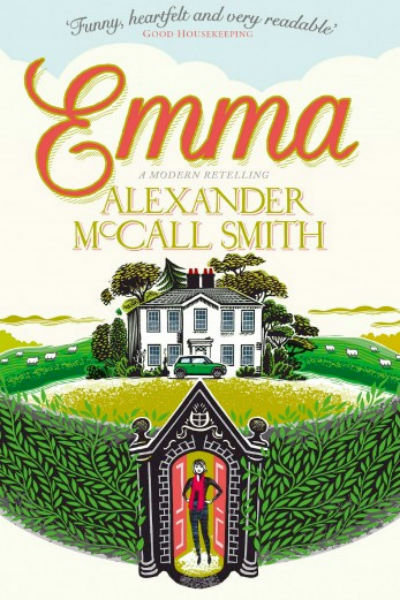 And today we want to share with you our views on a modern version of “Emma” written by Alexander McCall Smith. Alexander McCall Smith is one of the most famous authors today. His “No. 1 Ladies Detective Agency” series has achieved huge commercial success all around the world. In addition to this, he also writes Isabel Dalhousie (The Sunday Philosophy Club) novels, The “44, Scotland Street” series and numerous standalone works that range from war stories to our daily lives. He has two daughters and he shares some of the wisdom from their growing years in “Emma”. The plot and the characters are more or less same as the Jane Austen classic. The rich and indolent Mr. Woodehouse has two lovely daughters. The young and passionate Isabella marries John Knightley, who is a photographer in London, after a whirlwind romance. While younger Emma has finished college in Bath but has no interest in getting married in a hurry. She has her excellent Scottish governess – Miss Taylor. And then there is Mr. George Knightley – the classic Englishman. Events unfold in the same way as the original story. Emma becomes interested in matchmaking, befriends Harriet Smith, becomes envious of Jane Fairfax, imagines herself in love with Frank Churchill, keeps thinking about starting an interior decoration business, but doesn’t find the time or drive for it. But eventually, through all these day-to-day life situations and through making some bad choices she realises that when one tries to orchestrate human lives, one must also put up with unforeseen consequences. That you cannot make love happen between two people, no matter how suitable they are in outward appearances and behaviour. That sometimes we hurt people we care for without intending to do so and it becomes very difficult to go back and make repairs over the damage done. What we find most appealing in Alexander McCall Smith’s writings is his musings about the human nature and our reactions to various situations. He is always a tad philosophical without making a heavy work of it. There is a lightness and humor through the entire narrative of Emma. This is not a story about the perversity of the universe, this is a story about learning to live in the adult world. This “Emma” is cute and appealing with her little quirks and mistakes. This Mr. Woodehouse is very like the other except that the modern Mr. Woodehouse now can keep an eye on the entire world’s weather and not just that of Hartfield :). The track with Isabella and John and Mr Woodehouse’s reaction to a modern man with tattoos and an Italian motorcycles is very funny. The twist about Mrs. Goddard being an ex-Hippy and eventually falling in love with Mr. Woodehouse reflects on modern times where the social hierarchy of the Jane Austen world has almost disappeared. After all, in today’s world with its stress, uncertainties, complexity and vastness, we are all looking for that little corner filled with love, peace and some happiness. And if life offers you that chance at any stage than it is worth seizing without worrying about age factor. Considering the author’s Scottish heritage and his fondness for all things Edinburgh, Miss Taylor represent the best there is in terms of Scottish Governesses. She becomes mother figure for both Isabella and Emma without replacing their mother either in thoughts or in deed. Was it headstrongness – a trait that you found in certain children who simply would not be told and who insisted in doing things their way? Or was it something to do with the desire to control? There were some children who were, to put it simply, bossy, and little girls tended to be rather more prone to this than little boys – or so Mrs Firhill believed. Yes, that was it, she thought. Emma was a controller and it was perfectly possible that Miss Taylor’s influence would make it worse: If you were brought up to believe that there was a very clear right way and wrong way of doing things, then you might well try to make other people do things your way rather than theirs. The beautiful are seldom lonely, unless they chose to be. London, with its play and its parties, beckoned; it was as if its lights, bright and seductive, penetrated into the country even as far as Hartfield itself, lighting the winding way to the distant city. It was a matter of submitting a good photograph to the editor of Country Life and asking him to consider featuring one’s daughter in a future issue. Success was by no means guaranteed, even for the highly photogenic: there were many girls in many counties, all most eager to appear, or at least all having parents who were eager on their behalf. And parental support in this was crucial; self-nomination was unheard of, as the very act of putting oneself forward would be incontrovertible proof that one was not suitable. George Knightley had that endangered and most attractive quality: an old-fashioned Englishness, in appearance, garb and manner, and a generosity of spirit that made him extremely popular in the neighborhood. Typically, there then followed a listing of those who might have bought Donwell Abbey had it been put on the open market: hedge-fund people, dot-com people, Russian Oligarchs, celebrities of various stripes – the list was a long one and generally concluded with a sigh of relief that he Knightleys remained exactly where they had been for centuries. Disinclination to discuss a subject that needs to be discussed is never a solution; the topic merely assumes increasing prominence the longer it remains untouched. Every conversation that is then embarked upon, even if on a totally unrelated subject, will be conducted in the fear that it might suddenly be interrupted by the forbidden issue; every pause might be read as a sign that what has been unsaid so far might now suddenly be said. Eventually, of course, the strain tells, and the matter can be put off no more. They understood that when another’s mannerisms begin to grate, it is probably too late to retrieve the situation, even if a relationship might be patched up with a lot of effort and forbearance. Pluto: The chariot is the soul. It is driven by the charioteer but pulled by two horses – one dark and one light. The dark horse represents all the brute appetites – concupiscence and so on. The light horse is to do with finer things: awareness of others, generosity, civilisation – the finer side of our natures, in other words. The job of charioteer is to harness the energy of the dark horse and to make sure that the light horse is not pulled downwards by its companion. Within us all, there is often more than one person, more than one self. Although it doesn’t replace the classic Jane Austen ‘Emma’ for us, we did enjoy reading this modern version of the quintessential tale, and we can recommend reading this for anyone who enjoys introspection and a journey to discovery of oneself. Around 8 stars out of 10.